You fi nd your hard disk full once every few months. It is surely a case of fi les that have been stored twice. The only question is, where? The freeware clean-up command AllDup helps in tracing fi le duplicates. According to the manufacturer, the program runs on Windows 2000, XP, Vista and 7. INSTALLING THE TOOL: Save the zipped fi le ‘alldup.zip’ in a directory of your choice and extract it. Double-click on ‘alldup.exe’ in Windows Explorer for installation and follow the setup instructions. You must authorize this action by selecting a user account with administration rights and entering the correct password. SPECIFYING THE SEARCH CRITRIA: After installation, start the program with ‘Start | All Programs | AllDup | AllDup’. Click ‘Search method’ in order to specify the criteria for detecting a duplicate file. Place a check mark in front of every identification feature of your choice for this. You should at least activate ‘Name’, ‘Ending’ and ‘Size’ in order to identify identical files. The byte-for-byte comparison of the file contents (‘Contents’) adds to the safety. Moreover, you can include the creation and modification date as well as the fi le attributes. DETERMINING THE SEARCH LOCATION: Click ‘Source folder’ and determine the directories that AllDup should look through for duplicates. 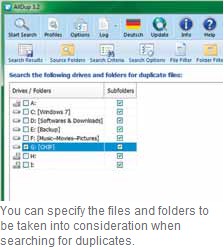 Place a cross mark in front of the desired entries in the ‘Drives/Folder’ column for this. If you want the tool to also include the sub-folders of a directory, additionally activate the option in the ‘Subfolder’ column. AllDup off ers all the existing drives as ‘directories’ by default. However, you can use ‘Add’ to add the folders of your choice, in order to restrict the search for duplicates to sections of your directory structure. You can then ‘Start the search’. AllDup presents the result in a clear list with the names of fi les for which it has identifi ed possible duplicates. Click on the tiny plus sign before the name to see the path as well as other information pertaining to the identifi ed fi le. DELETING FILES: In order to delete the fi les, mark the path and press [Del]. The tool enables a repeated confi rmation of this action. Alternatively, right-click the entry. The context menu provides other options. The ‘Add fi le to fi le filter’ is the most interesting option. You can use this option in case AllDup identifi es those fi les that are not duplicates as duplicates. This happens in some cases with confi guration fi les such as ‘picasa.ini’. If you add these file names to the file filter, the tool ignores them in all the future runs. Moreover, it also off ers the option of opening the fi les or the included folders and viewing the fi le properties.